Figure 2-9. Graph Showing Values of Factor y°®tJ> + VB+l Versus B When C = 6. Thus, it appears that the total counter-recoil time will be minimum if the barrel spring and bolt driving spring are proportioned to each other so that the ratio between their average forces is equal to the cube root of the ratio between the barrel weight and bolt weight. It will be assumed for purposes of the example that the barrel is six times heavier than the bolt, that is, 0=6. for various values of B when C=6. Note that the curve reaches its minimum point at B=1.82 which is the cube root of 6. If this ratio between the spring forces were used in the example, the total required average force of 450 pounds breaks down so that the bolt spring would have an average force of 160 pounds and the average force of the barrel spring would be 290 pounds. It should be realized that the use of a bolt spring with an average force as high as 160 pounds would cause difficulty in charging the gun manually unless some mechanical aid is provided. For this reason, it may be desirable to increase the ratio B, thus sacrificing some speed of operation for ease in charging. However, if the gun is to be charged pneumatically or by some other means, the computed values are not unreasonable and will therefore be employed for the remainder of the analysis. The next problem relating to the design of the springs is to choose values for the initial compression Fo and the spring constant K such that the required average force will be obtained when the springs are compressed through the desired recoil distance (10.5 inches in the example). 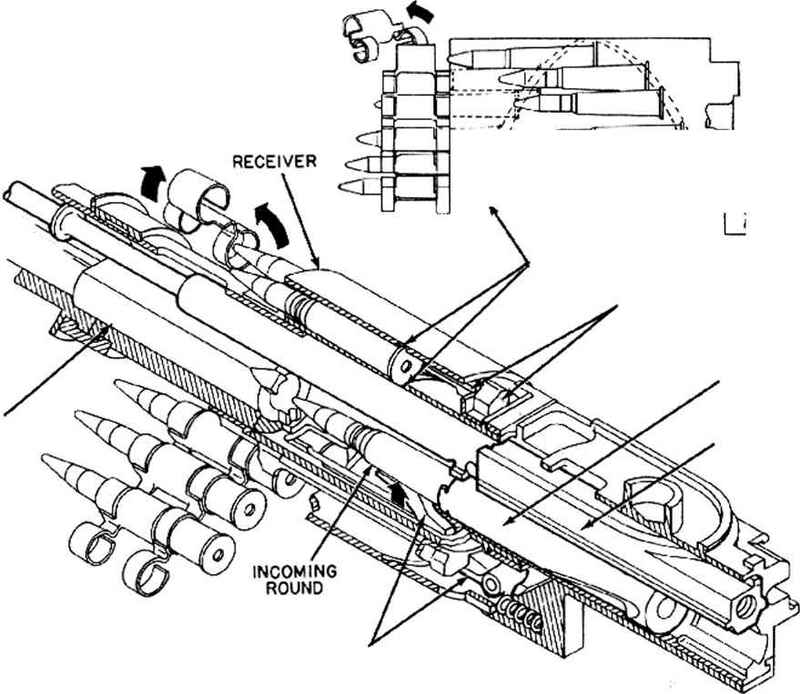 As has been mentioned before, the practical problems involved in designing springs for machine guns require very careful analysis to take into consideration such factors as spring losses, forced vibrations set up along the length of the spring, shock loads, and other complications. If this is not done, serious operational difficulties or even failure of the spring may-result. For this reason, the design of springs which are to be subjected to large and rapidly varying forces is a highly specialized art in the field of machine design and often a satisfactory spring for a machine gun can be found only by experimental means. Since it is beyond the scopc of the present analysis to attempt a practical spring design at this point, an arbitrary' selection of the spring characteristics will be made.